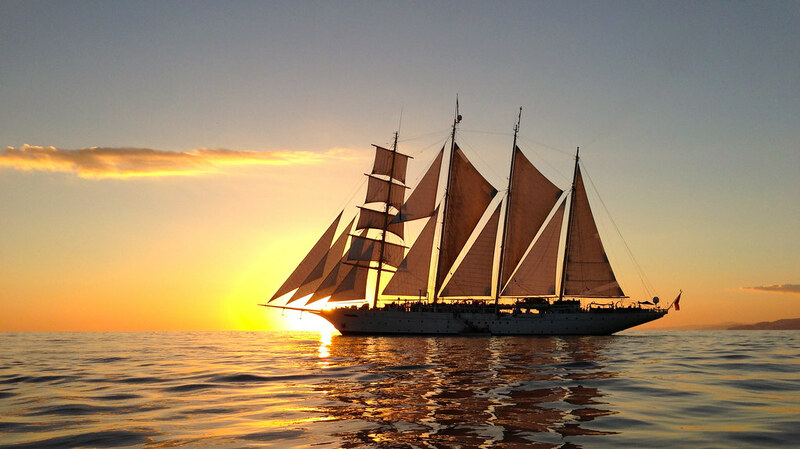 Tall ship sailing specialist Star Clippers will be sailing in Indonesian waters for the first time in 2017. The company, which operates three magnificent, fully-crewed clippers, is offering a choice of 19 departures between May 6th and October 14th 2017, and sailings of 7, 10, 11 and 14 nights, from Bali and Singapore, including Bali round trips and itineraries from Bali to Singapore and reverse. The four-masted Star Clipper, will voyage under thousands of feet of billowing sails sailing between lush, culturally unique and exotic port calls and drop anchor close to coconut-white coves that typify Indonesia's thousands of islands, mirroring a Robinson Crusoe adventure, as the ship calls into tiny jungle-and-sand islands, haloed by crystal clear turquoise sea and white sand beaches. Indonesia's towns and villages provide the opportunity for guests to experience the exoticism of Hindi culture, eccentric looking gods, with incense wafting through the balmy air, and colourful sights and scenes with bustling streets and markets, returning at the end of each day to the spectacular Star Clipper, where sundowners are served on teak decks before dinner and a memorable departure to the strains of Vangelis's "1492 Conquest of Paradise" and on to the next exotic adventure. Highlights of the six new itineraries in Indonesian waters include the opportunity to view Komodo Dragons, the world's largest living species of lizard that live on Indonesia's islands, growing to a maximum length of 3 metres (10 ft)and including birds and mammals among its carnivorous diet. Of particular interest to Star Clippers' guests will be the opportunity to see the `Pinisi' traditional Indonesian sailing ships, with their long, elegant bow, towering twin masts, streamlined wooden hull and seven billowing sails. These hand-built ships, continue the spirit of the golden age of sail which ended in the west in the early 20th C, before being recreated by Star Clippers, and thrived in Indonesian waters until recently. A port call into the traditional villageof Wera provides the opportunity to see these traditional craft being made and sailed. The compact size of the Star Clippers' vessels enables the ships to sail waters uncharted by most commercial cruise lines. Typical of the type of port call that this opens up to guests is a call into the island of Pulau Satonda, off the northern coast of Sumbawa, formed by a volcanic eruption on the sea floor millions of years ago. Satonda is a natural volcanic island, also a Marine National Park, with towering mountains that shelter a beautiful salt-water lake in the crater, and surrounded by a wealth of coral reefs. Other memorable highlights include an optional excursion to Mount Bromo, an active volcano in East Java, 2,329m high, set in the middle of a vast plain and protected nature reserve known as the "Sea of Sand". Locals throw offerings of fruit, rice, vegetables and livestock sacrifices into the caldera for the mountain gods on the fourteenth day of the Hindu festival of Yadnya Kasada. In the southern part of central Java guests will have the opportunity to visit the Borobudur Temple Compound, built in the 8th and 9th centuries, and one of the greatest Buddhist monuments in the world. Also of immense local cultural interest is the Pura Ulun Danu Bratan water temple on Bali, built in 1663. Resembling a vast, layered Christmas Tree the temple complex is on the shores of Lake Bratan, with its cold, tropical climate, and the temple complex is used for offerings ceremonies to the Balinese water, lake and river goddess, Dewi Danu. In the spectacular Indonesian waters Star Clippers complimentary water sports offer will keep the energetic sports crew busy, as guests will enjoy snorkeling, kayaking and canoeing off many of the beaches and islands included in the exotic itineraries. A 7 night Indonesia sailing on board Star Clipper, cruise only, costs from 3.185 AUD per person, including all meals on board & port charges.